Sometimes, it’s interesting to learn what is being Tweeted (micro-blogged) about particular topics in real time along with who is posting which messages. NodeXL enables the extraction of individuals engaged in a particular hashtag-labeled microblogging conversation through Twitter’s application programming interface (API). This entry will provide an overview of how this is done. A hashtag is a snippet of text prefaced with a # (hashtag or pound) sign which indicates that the message is focused on a particular theme or topic. In Twitter, the microblogging site, various Tweeted threads are collected around hashtags for coherent 140-character conversations from people from around the world. A hashtag search of Twitter, then, involves the extraction of entities (Twitter accounts representing people, robots, and cyborgs) who have conversed around a particular topic. The application programming interface (API) used in NodeXL only extracts hashtag searches Tweeted in the prior week and a half. In real life (IRL) Joe knows Bob, Adam, and Sue. Joe’s looking to start venturing more into social media, to see what all the buzz is about. Joe created a Facebook account a while ago, but never uses it. Joe is friends with Bob on Facebook, but Adam and Sue don’t use Facebook. Joe chats with Adam on IM, but Sue and Bob don’t do IM. Joe knows Sue is a huge fan of Twitter, but Bob and Adam don’t like it one bit. Joe really just wants to connect with all of them online and it seems like such a hassle to have three different ways of communicating with them using social media. In this common scenario, Joe is overwhelmed by it all and gives up before even getting started. While there is a lot to keep track of, it can be simplified a bit. A little more than two years ago, a new form of communication was birthed: microblogging. Microblogging is a short form of blogging that allows users to send brief text or multimedia updates and publish them to a private or public audience. These messages can be published via a variety of means including text messaging, instant messaging, e-mail, or the Web. While you may not be familiar with microblogging, you have probably heard of Twitter. 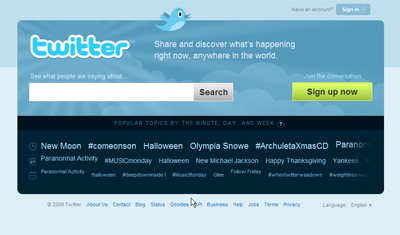 Twitter has become the default example of microblogging, due in large part to its popularity. Twitter is a service that started as a side project by Odeo in March 2006. Shortly after spinning off as its own company in August 2007, it quickly became apparent that there was something unique and useful about the service.